Spoiler warning! In my explanation of what worked and didn’t for me in this story, I will be going into plot specific details. If you want to approach this story completely unspoiled, you may just want to read the first few paragraphs. 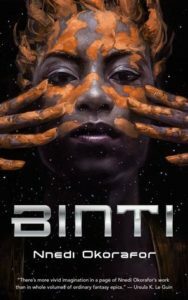 Binti is the first of her people, the Himba, to be offered a place at the Oomza University, the finest in the galaxy. She pretty much runs away, knowing that her decision to take her place at the university might mean she is no longer welcome back with her family. While the prospect of going far away is daunting, the promise of using her skills and learning is a heady draw. On the space shuttle on the way to Oomza, she begins to make new friends, but then disaster strikes. Oomza University has wronged the Meduse, a race of jellyfish-like aliens who are known throughout the galaxy as warlike and fearsome. Binti is in terrible danger and needs to find a way to communicate (and hopefully placate) these beings if she is to survive and make it to her destination. In 2016, this novella won the Hugo, the Nebula and the Nommo Award and was nominated for a Locus. I had heard a lot about it and Nnedi Okorafor, so when this was the monthly pick in Vaginal Fantasy a while back, I figured it was finally time to read it (as is the case more often than not, I didn’t actually get round to reading the book until after the hosts had discussed it, but the various hosts’ enthusiastic responses to the story made me optimistic). Having heard so much about it and with it having won so many awards, I was expecting something more. The rest of the review (which will contain spoilers) is on my blog. Share the post "Not what I was expecting"
I do TRY to like sci-fi, so every so often I try the genre and read new things. This didn’t really work for me, Kindred (which I’d classify as a historical novel with sci-fi elements – a bit like Outlander) was excellent, but I really liked All Systems Red, which is clearly sci-fi.